When it comes to looking your best – either as a team or in a solitary sport – a personalised sportswear item can really add the professional touch and distinctive edge. Its important however to consider the options available, which suits best and fulfills your aims and needs. The most common form of clothing embellishment is in custom printing. Our printing services offer a range of styles and types for simple and more complex requirements, just browse our samples. For simple text or a simple outlined logo, a single colour vinyl print is recommended. This involves a coloured vinyl being cut to the outlines of your text or image in a wide choice of colour for bold clear graphic appeal. If your team’s sponsor artwork or even your team badge is more complex and features multiple colours, then a full colour vinyl print is needed, however this may take longer and require more from you. This process involves printing a design onto the vinyl, then cutting its custom shape for the finished product, but relies upon the high-resolution artwork and outlines which are not always available to teams. Finally for something special, the unique specialised vinyl and inks available to create stylish effects and high quality designs. Examples include fluorescent vinyl, metallic printing, sparkle, glitter and pattern print. Also available for stand-out text is embossed ink printing, click here to find out more about our specialist printing options. If the shiny appeal of printing doesn’t do it for you then perhaps embroidery is the answer. Rather than the smooth solid colour effect from vinyl printing, embroidery and stitched in personalisations offer a more traditional look that often give a more defined and classic look. 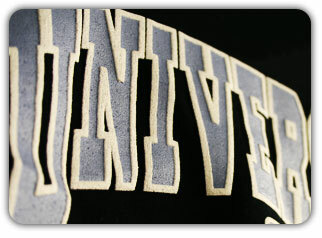 Embroidery can be used for text and names but also quite large for logos or strong graphics. The limitations can be in too large or too small requirements and as always down to the quality of the logo, but the look is quite different from printing and could be perfect for that bespoke tailored design. As already shown there are many options open to any team needing personalisation, but its important the right options are considered and the correct choices made. What budge can your team stretch to? What are the essentials and what are extras? Which sections of the team kit are most likely to be seen during matchplay or at other times wearing the kit? Important factors also are in maintaining the consistency throughout the design in colours and sizes, plus knowing when to add and when to stop. The options and availability for personalisations give a troubling choice for your decision maker to get the right choices and ensure a well created look for your team. For more information on our printing & embroidery services, or to get a quotation about personalisations for your team, click here to send us a custom enquiry.